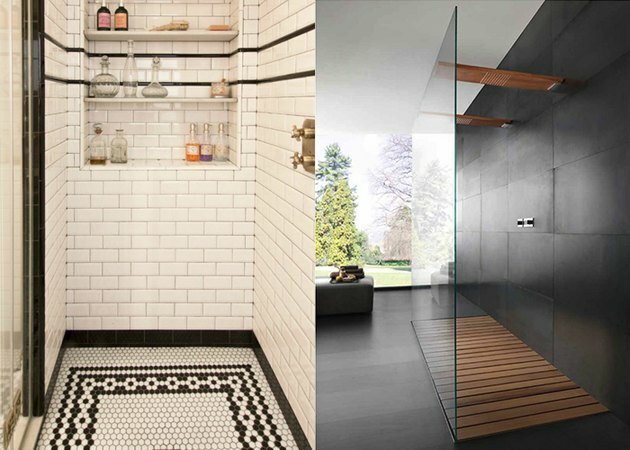 When you think of a bathroom, the shower floor probably isn't the first thing that comes to mind, but it should be. 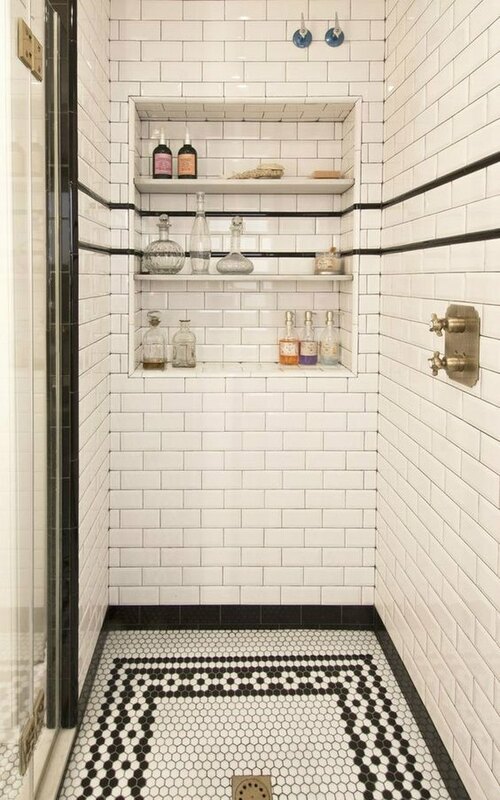 For such a relatively small space, your shower floor says a lot. 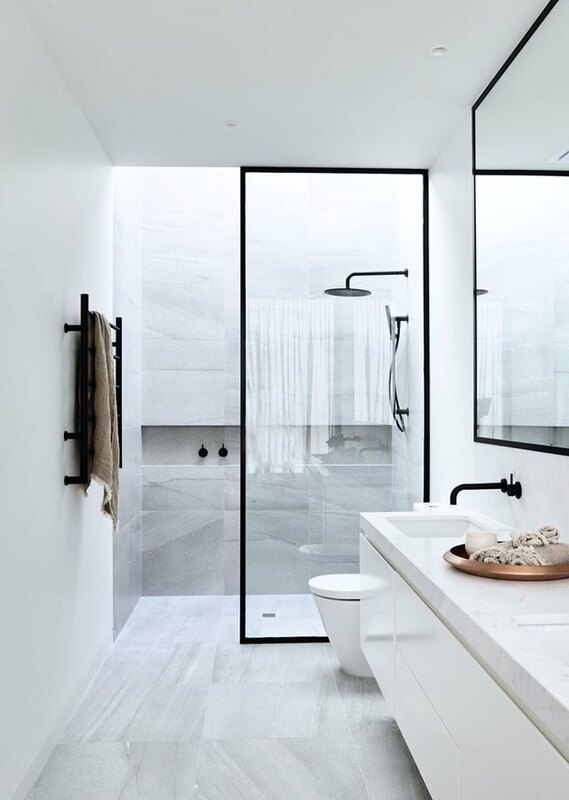 Whether it's wood or marble, ceramic tile or natural stones, this sometimes overlooked space can truly set the tone for the rest of your bathroom. And it's relatively easy to experiment with. No matter if you've had your floor designed by a pro or if you can do it yourself, your shower floor could easily become your favorite spot in the house. 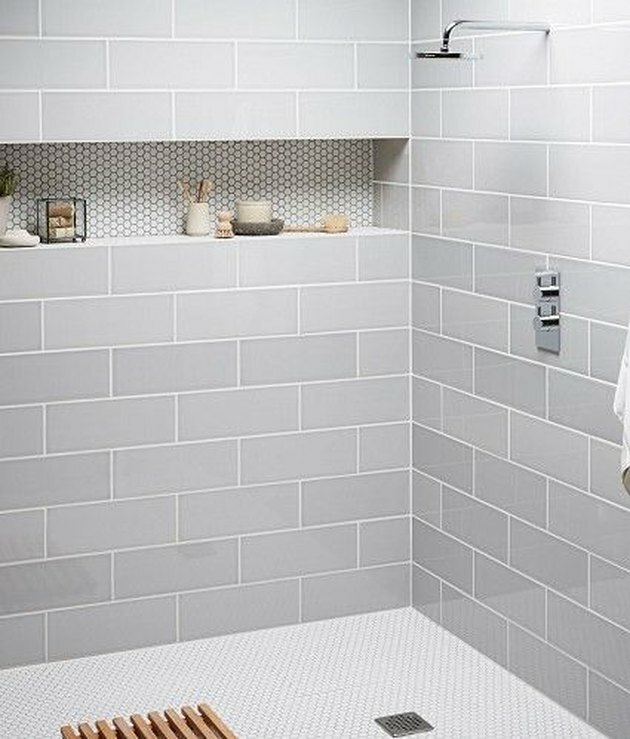 These shower floors will have you rethinking everything you ever knew about how great a shower could be. Marble tile floors can add an extra dose of luxury to any bathroom space, if you can keep it clean. Marble is porous, so it can be easily damaged or stained by different beauty products and cleansers. It comes with a cost higher than similar materials, but depending on the home, the beauty can outweigh the hassle, like in this design by Milton Development. Wood might not be your go-to idea when it comes to shower flooring, but it's actually an appealing option. All wood isn't created equal, but some, like cedar, redwood and teak can hold up to the humidity due to their biological makeup and certain sealing techniques. Cedar's natural flair can add a spa-like quality to your space. Incorporating natural stones, like pebbles into your flooring is a way to lessen the likelihood of slipping in the shower while bringing the outside in. As long as the pebbles are installed properly, cleaning's a breeze. 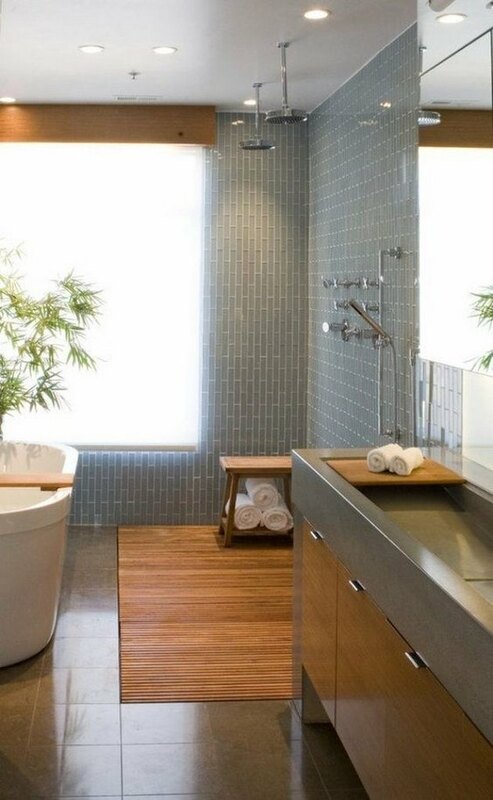 In this bathroom space designed by Remy Meijers, pebbles add texture and a natural element to a relaxing, minimalistic space. 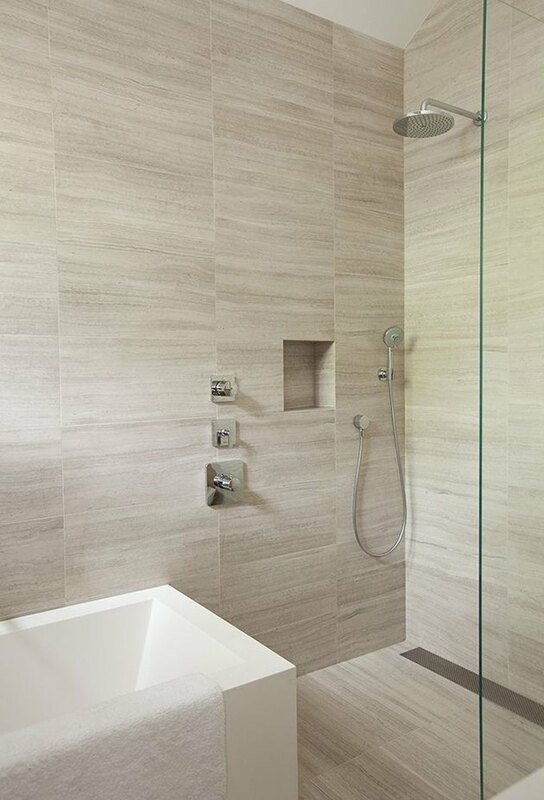 Porcelain is a versatile option for a shower floor, and it comes in different styles and textures. For a shower floor, a more textured style could aid in preventing falls, as porcelain can get slippery. The stone is also durable and waterproof, so it can hold up to everyday use. To keep porcelain looking fresh, be sure to clean it regularly. 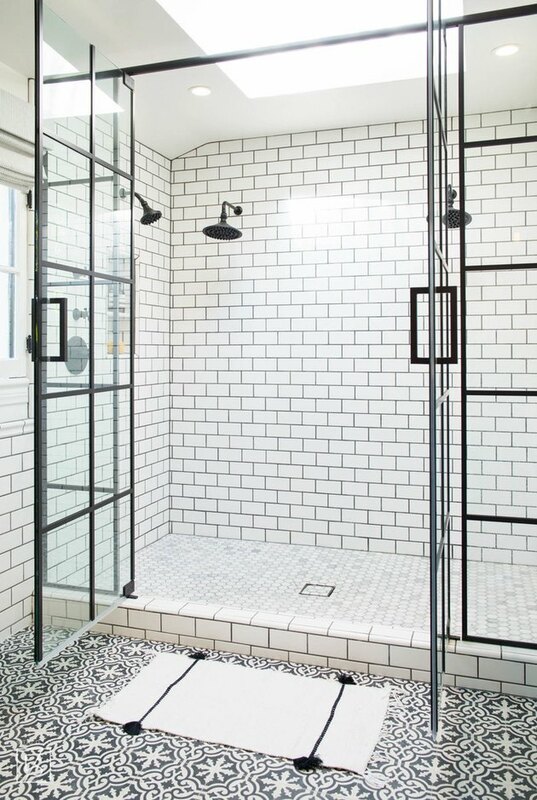 For a stylish and cost-effective shower floor, consider using concrete. Once it's sealed, it's simple, easy to clean and incredibly versatile. It also has enough texture where it won't get slippery like other materials. If you like the texture but not the gray hue, you can even paint it. 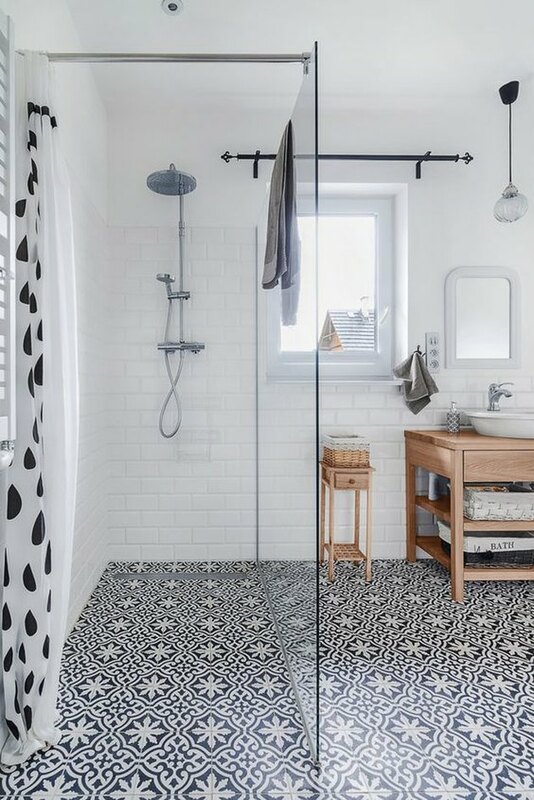 Penny tile is an adorably versatile option for shower floors that can easily compliment the rest of the shower and bathroom. In this bathroom design by Topps Tiles, penny tile accentuates the larger gray subway tiles it's paired with. Patterned tile is a fun way to add drama to a space, and it can be styled in a variety of ways. In this bathroom by Studio McGee, black and white floral tile ties the rest of the room together while injecting a little whimsy. If subway tiles are the go-to tile for walls and backsplashes, hexagonal tile is the same for floors. The geometric tiles are stylish and come in a range of sizes. In this bathroom by Studio Lifestyle, hexagonal tile is the glue that holds together a three-tiled design scheme. And it looks good while doing it. 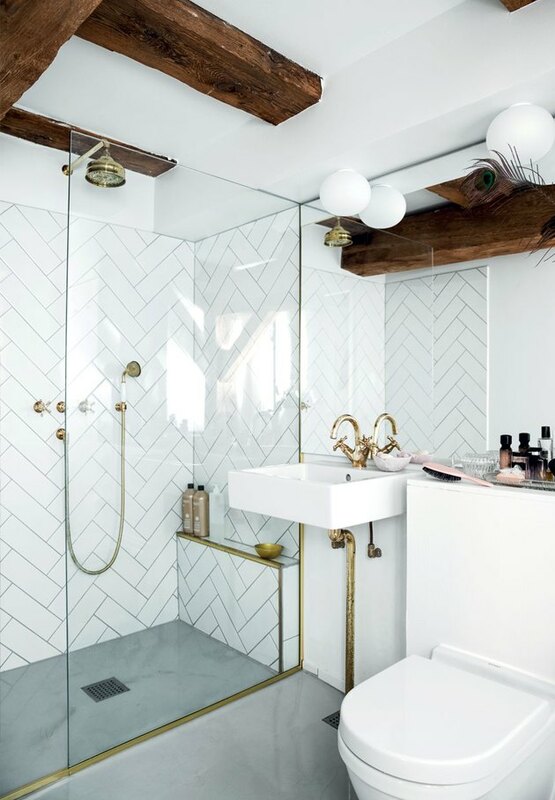 Few things are more classic than a herringbone pattern, even in your shower. If you have rectangular tiles, you can install a herringbone pattern yourself. 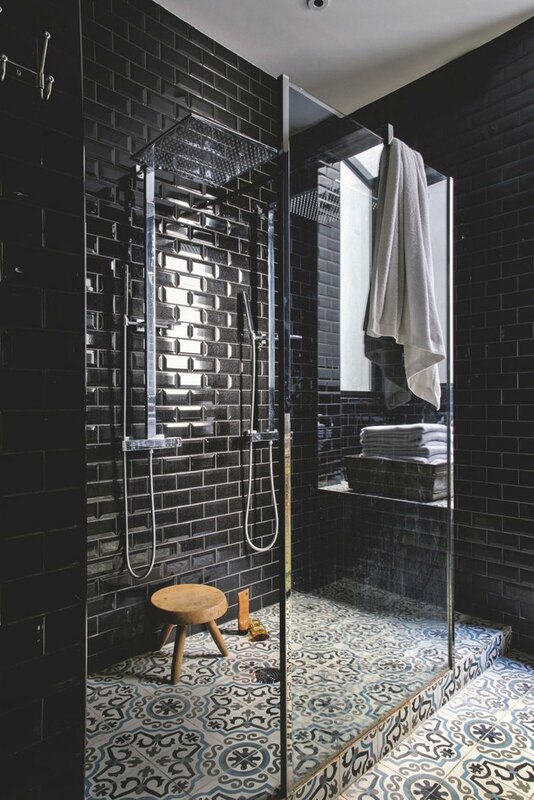 This bathroom's herringbone floor extends seamlessly into the shower. 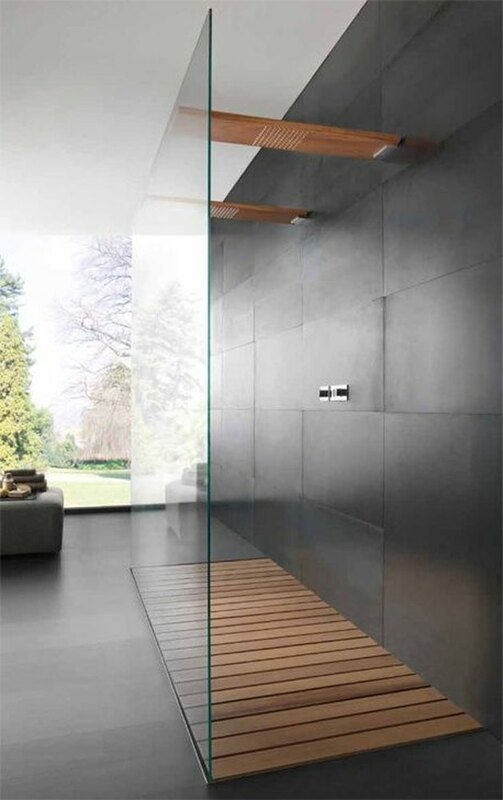 Teak's natural resins cause it to bend instead of break, making it ideal for use in the shower. For an easy upgrade to your shower pan, build a teak floor of your own. If you like a combination of tiles, or want to make a custom statement with your shower floor, consider a tiled mosaic. First step: picking the right tile. Another natural stone flooring choice, limestone offers up durability that's perfect for a lifetime of use in your shower. Keeping limestone clean is key to ensuring you'll have it for years. Mixing solid neutral tile with colorful patterned tile is a guaranteed way to make a statement in your shower while having some fun in the process. Who says shower trays have to be boring? 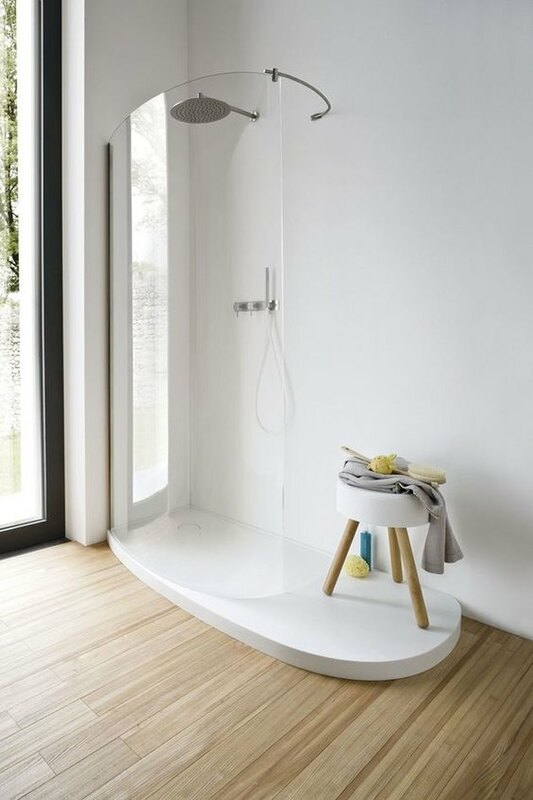 This shower tray from ArchiProducts comes in a raised platform with a unique shape we can appreciate. 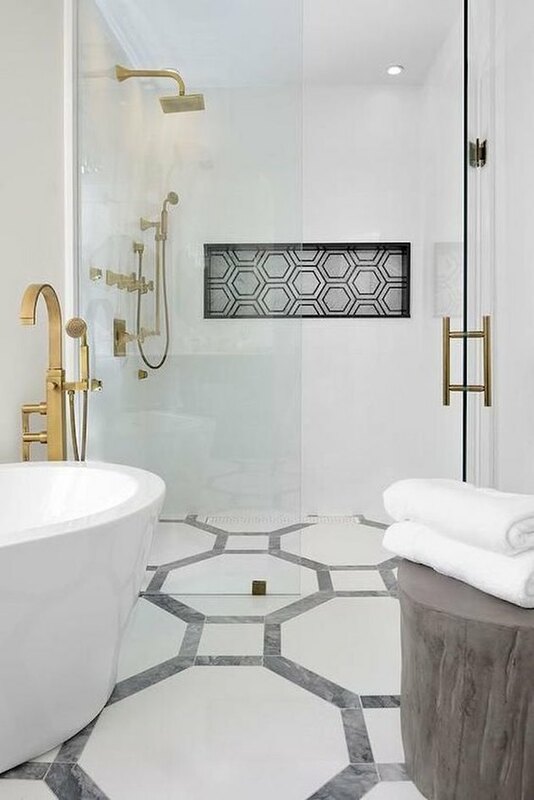 If you like the thought of a mosaic, but want it to extend throughout your bathroom, be inspired by this design's larger take on a classic geometric pattern.